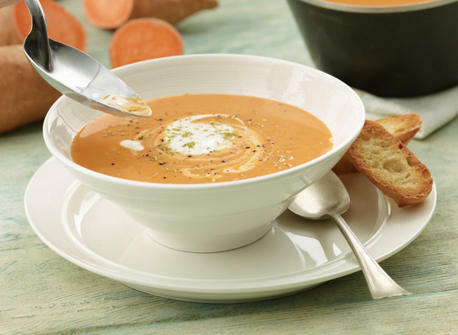 The southwest spice of chili and lime made this soup a smash hit in 2007. 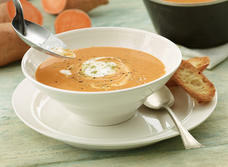 Now we’ve added the tangy goodness of yogurt and a little zing of zest for our new soup sensation of 2012. In large pot, melt butter over medium heat. Add garlic, onion and chili powder; sauté for about 5 min or until soft. Add broth and sweet potatoes; bring to a boil. 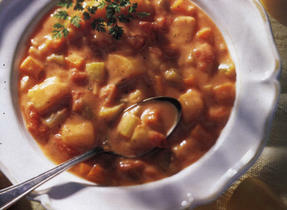 Reduce heat and simmer until potatoes are soft, about 20 min. Transfer to blender or food processor, in batches, or use an immersion blender in the pot, purée until very smooth, adding some of the milk if necessary to thin. Return soup to pot, if necessary. Stir in milk and salt. Heat over medium heat, stirring, until steaming, but do not let boil. In a small bowl, whisk cornstarch into 1/2 cup (125 mL) of the yogurt. Stir into soup; heat, stirring, for 1 min. Stir in salt and season to taste with pepper. Stir lime zest and juice into remaining yogurt. 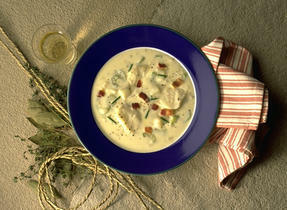 Ladle soup into warmed bowls; dollop lime yogurt on top of each serving. Sweet potatoes are often mis-labeled as yams (true yams are quite different). Choose sweet potatoes with tight, brick-coloured skin and no signs of wrinkling or mold and that feel heavy for their size. The flesh should be firm, moist and bright orange. Use ancho chili powder in place of the regular chili powder. Add 2 tbsp (30 mL) unsweetened peanut butter with the sweet potatoes; sprinkle chopped peanuts and chopped fresh cilantro on top of yogurt. 163 people love this recipe.